Well you haven't made a mark until your up on a billboard, so they say and that's what I saw yesterday as I was driving my way to the ApacheCon conference. 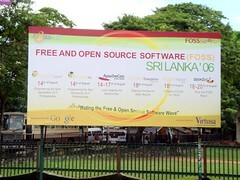 Many thanks to Virtusa for donating their hoarding to the FOSS community during the FOSSSL 2006. Also a special thanks to the army dude that gave me permission to take this picture. Sorry for forgetting to take your name down. You can see the hoarding in front of the Bera Lake.